Coming into Tuesday night’s game against the Red Wings the Devils knew how big a game this was in the standings, only trailing Detroit by three points for the last playoff spot in the Eastern Conference. For Devils fans the game was a big one for different reason as it could have been the last game at home and in a Devil uniform for goalie Martin Brodeur. With weeks of rumors, including one earlier in the day that had Brodeur traded to Minnesota Wild as a done deal- it had been a crazy day for Brodeur and nerve wracking for Devils fans who don’t want to see their legendary goalie traded. Two important points they need, but the night belonged to Brodeur who was serenaded with chants of Marty even before the first puck dropped. It wasn’t his best game but Brodeur stopped twenty shots for his 15th win of the season. 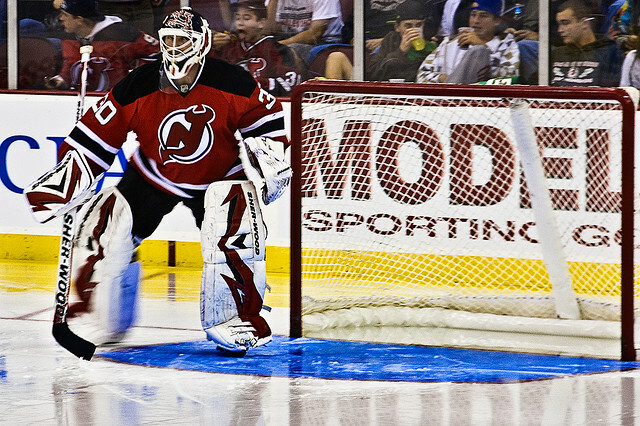 Wherever he might stand on staying a Devil or leaving, Brodeur was not tipping his hand at anything. “These are private matters between me and him” added Brodeur. “It’s been a hard couple weeks. It’s been a hard last of the season with me not playing a lot”. The Devils don’t have to wait long to face their Detroit again as they head to Detroit on Friday night. “Going there is another big game for us. Obviously we know where we are at in the standings but we have to keep playing the way we have been,” said Patrik Elias who had an assist on the night to continue his hot play since returning from the Olympic break. The Devils might be in a position to do that, but the Devils fans hope general manager Lou Lamoriello is not in a position announcing a trade of Martin Brodeur. One thing is for sure, traded at the deadline or not Brodeur will always be a Devil.